If you have a newborn in the house, you will understand the pain and discomfort that an infant goes through while teething. Teething is a biological process where the baby teeth or the deciduous teeth of the infant begin to emerge through the gums. You can identify when a child has started teething by observing some everyday actions. Teething rings help to control the chewing habits and also soothes the gums. It helps a baby to stay comfortable. Since the teething rings go in the mouth of your baby, it is of utmost importance to ensure safety before giving teething ring to the child. Let’s read further to look at the 4 easy tips that you can follow while giving teething ring to your baby. When does a baby start teething? 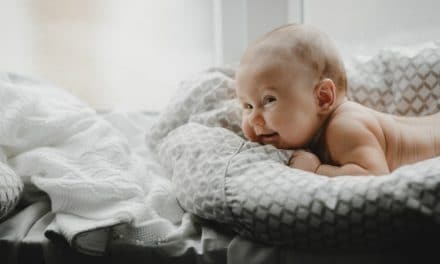 A baby typically begins teething as soon as the primary teeth get ready to erupt and are positioned near the surface of the gum. Teething may sometimes also cause a rise in body temperature. Usually, it happens at around the age of 6 to 10 months. The primary teeth always erupt in pairs and the first two teeth to erupt in a baby’s mouth are the lower front incisors. This period of teething is very crucial for the proper eruption of the primary teeth. The child may seem to be irritable, fussy and restless. Teething toys help to stimulate the eruption rate while reducing the discomfort that a child may otherwise suffer. What is a teething ring? A teething ring is a baby product that is made of firm rubber. It is used to soothe the gums of the baby and thus help the baby during teething. These rings are firm enough to withstand the biting forces of the mouth while gnawing but also pliable to prevent any discomfort to the baby while chewing on it. Teething rings come in different shapes and sizes. Some of them are smooth and some may have bumps or lumps to increase the benefits. Often, the teething rings are placed in a refrigerator before use as cold objects provides more comfort to a baby. Why is a teething ring used? Teething rings help to massage the gums of the baby and relieve the pain and discomfort. The erupting teeth may feel sharp through the gum surface and a teething ring acts as a guide that helps the teeth to easily break through the gums while maintaining comfort in the mouth. Cold teething rings provide a numbing effect over the gums and relieve the pain and irritability that a baby suffers from teething. What can you do to maintain safety? Maintaining the safety of teething rings will ensure that your baby is using the best product that will not cause harm to the delicate oral tissues. A cool teething ring is best to reduce the soreness and pain of the gums in the mouth. When you try to freeze the rings, they become very hard and firm in consistency which can harm the delicate oral tissues of the baby. The extremely cold temperature of a frozen ring can also cause frostbite on the gums or lips of the baby. Therefore, refrigerated teething rings are recommended over frozen ones to provide a soothing effect without causing any harm to the gums. Some of the teething rings in the market contain potentially dangerous chemicals like phthalates. Phthalates are added to plastic toys to make them soft in consistency but over time, these chemicals leach out and can be ingested by the baby. Due to its possible harmful health effects, use of phthalate-containing teething toys has been banned in Europe and the United States except for California which still permits the use of such teething toys. To avoid buying teething toys that contain chemical toxins, read the labels on the back of the packet and look for the presence of phthalate, bisphenol A or even any fragrance. If you are still unsure, you can contact the manufacturer to ask for details. Teething rings filled with liquid can potentially break if excess biting force is applied to it, allowing the liquid to spill in the mouth producing a choking effect and contaminating the health of the baby. The Food and Drug Administration has declared not to use teething rings filled with liquid to prevent bacterial contamination. Teething rings that come with additional small pieces attached to it may look attractive. But the small pieces can prove to cause choking hazards. The beads, rattles and various other decorative pieces can dislodge into the throat of the baby. It is best to stick to a simpler form of a teething ring to protect the health of your baby. Teething may be a very unpleasant experience for your baby and teething rings can help to reduce the discomfort and soothe the gums to provide relief from pain. Always keep a check on your baby while he/she is using the teething ring. Use a simple version of the teething ring and do not forget to read the chief ingredients. NextHow can a Tongue Thrust Appliance Help Your Child?